Dossier accounts are free and require only some basic information to get started. 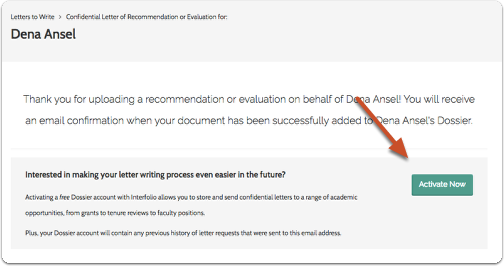 You don't have to create an account to submit a letter of recommendation, but Interfolio Dossier is a great way to store and send confidential letters of recommendation, evaluations, and requests. Why activate your free account as as letter writer? 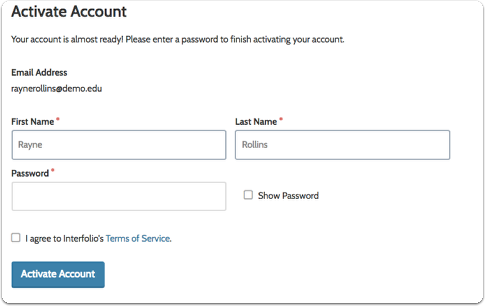 Activating a free account with Interfolio also allows you to store and send confidential letters of recommendation for candidates to a range of academic opportunities, from grants to tenure reviews to faculty positions. Plus, your account will contain any previous history of letter requests that were sent to this email address. You will see a confirmation message after you submit a letter to Interfolio. While you do not have to use Interfolio's Dossier service to submit your letter, a free account is created for you when a user requests a letter from you through our system. We invite you to activate your account and sign in so you can track your letter and use our other great features for managing the letters you are requested to write. Enter your name and password, and click "Activate Account"
Your username and password are used to keep your letters safe and allow you to come back and update your letters at any time, without needing to spend time searching through your hard drive or e-mail account.